The Salvin Amazon's is a subspecies of the Red-lored Amazon and is only found in a small area around southeast Nicaragua, Caribbean slopes of Costa Rica, Panama, Western Colombia and extreme northwest Venezuela; hybridises with autumnalis in northeast Nicaragua and lilacina in extreme southwest Colombia. Due to its small distribution area there have never been large numbers exported from the wild and are not common in captivity but thankfully it appears they are still relatively common in the wild. 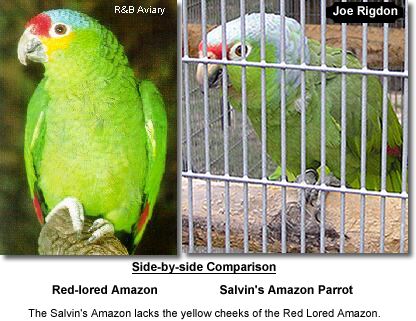 The Salvin's Amazon is slightly larger than the nominate Red Lored Amazon averages 13.75 to 14 inches (~35 cm) in length (including tail) with a wing length of 7.75 to 9 inches (200 - 230 mm). It looks like the Red Lored Amazon, except instead of yellow, the cheeks and ear-coverts are green. Also the inner webs of the outer tail-feathers are red. 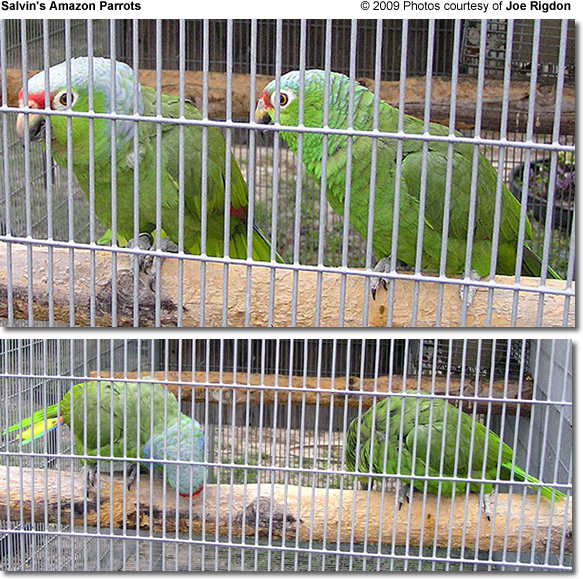 Salvin's Amazon Parrots are intelligent parrots that respond well to training. Amazon ownership generally presents multiple challenges, such as excessive chewing - especially at certain stages in their life. They do discover their beaks as method of "disciplining us" once they are out of the "baby stage" and they can generally be somewhat naughty, and it really is important to learn to understand them and to guide their behavior before an undesirable behavior has been established. Aggressive behavior is especially common in "hormonal" amazons. Undisciplined amazons will chew on electric wiring potentially causing house fires. They regard anything in your home as a "toy" that can be explored and chewed on; destroying items that you may hold dear or are simply valuable.